In a traditional Russian Orthodox church you wouldnt see a picture of the sermon on the Mount prominently featured in traditional Russian iconography with its suggestion of the importance of preaching in worship services. But things were changing in the mid 18th century. Western influences in the wake of the Protestant reformation and the Catholic counter-reformation, were creeping in, not just to Ukraine but to all of Russia. And of course, this icon screen is a totally different production from anything one would have seen in old Muscovy. The pictures now are entirely naturalistic and they almost disappear into the three-dimensional world defined by the elaborate decor and the statues that give this all a kind of vibrant feeling. 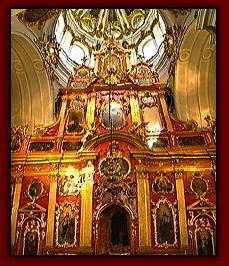 The icon screen is no longer square but is this curlicue shape of a Baroque church.